Closeup of one cluster of flowers. In some years the fruit set (flat pea-like pods) can be very heavy. I find them attractive. 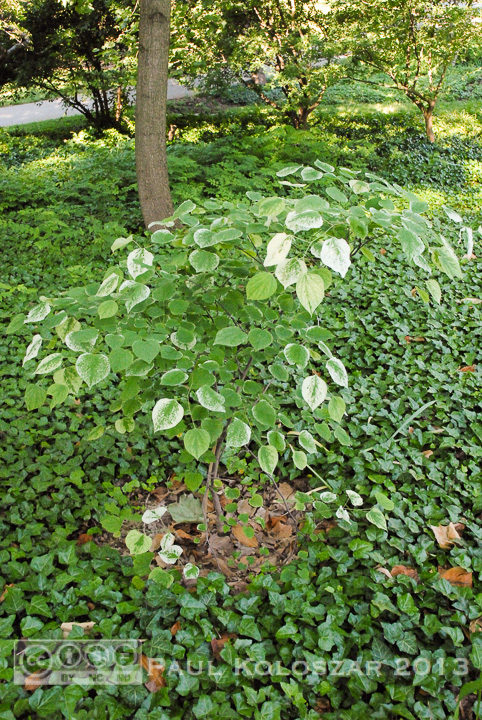 The subsequent seedlings can, in a garden setting, be annoyingly numerous. 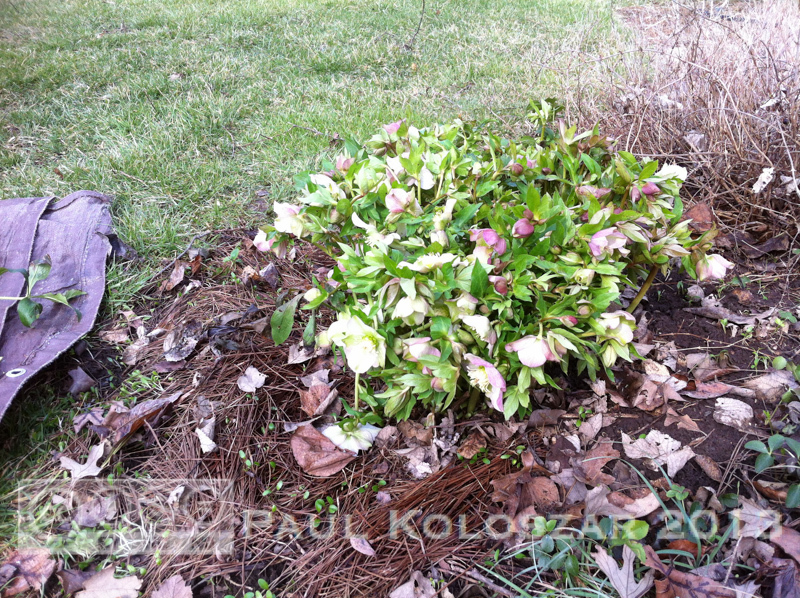 C. 'Forest Pansy' has purple foliage at emergence and for a little while after that. Mileage varies... 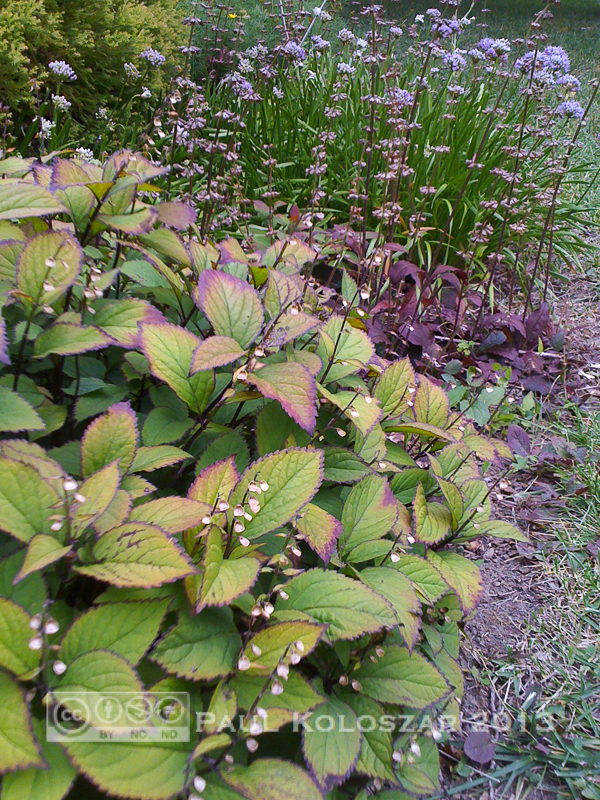 Some newer cultivars are better at retaining their color through summer. Also 'Silver Cloud'; again, mileage varies. Brr! But here's a good look at the form of C. 'Covey' (commonly marketed as Lavender Twist). 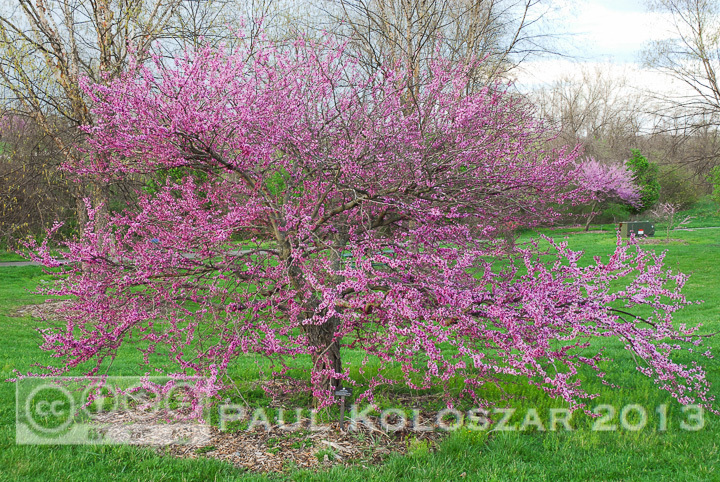 Aside from the weeping habit, the leaves and flowers are much like plain old redbud. 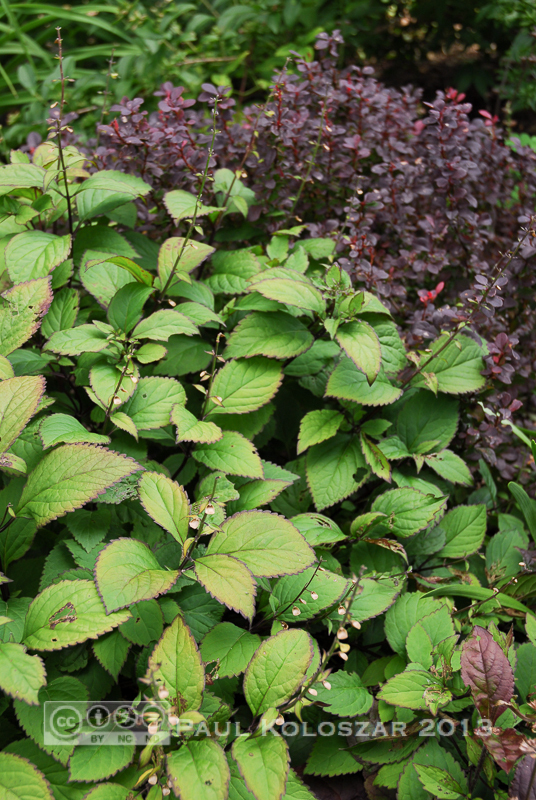 One can now get this form with either variegated or purple foliage ('Whitewater' and 'Ruby Falls', respectively). 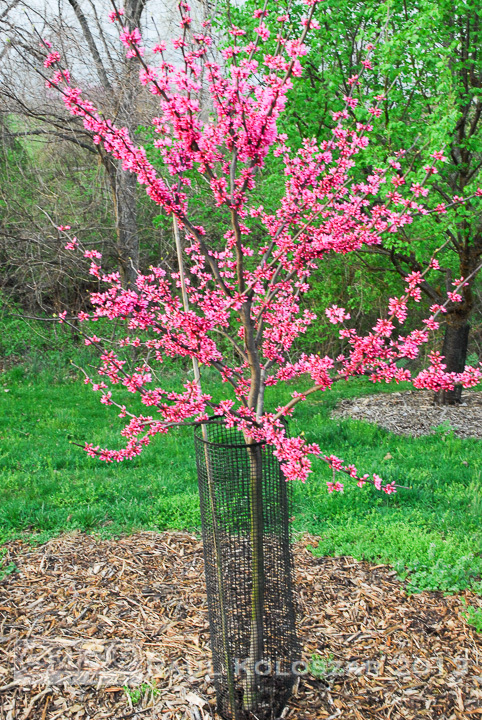 A redder redbud: C. canadensis 'Appalachian Red', fenced against deer rub. 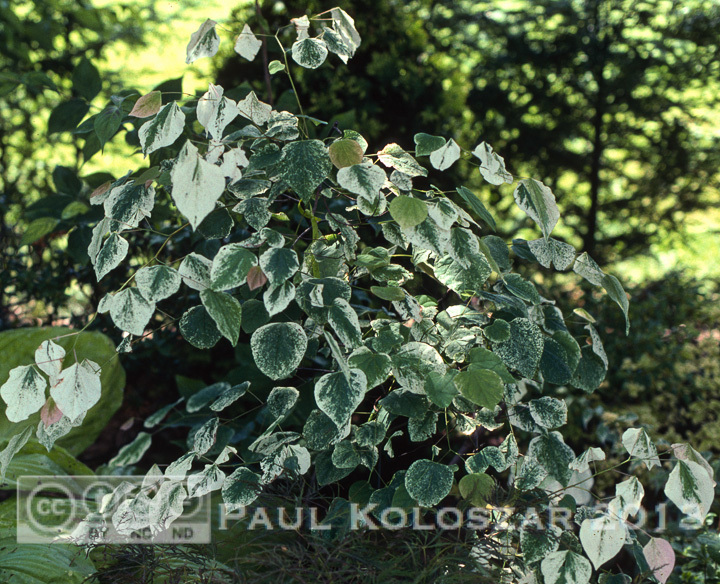 C. canadensis 'Alba', the white redbud (whitebud???). C. chinensis 'Don Egolf' is compact and floriferous. Warm April day. Gotta be outside. Things still to cut back (little bluestem, your days are numbered), Weeds already need pulling (fewer dandelions will be blooming around here this year). I love getting out in the garden. But, I really look forward to working in the garden on the early warm days. I love fragrant plants (have I mentioned this yet?). Sometimes a thing does not need to be visually enticing to be appreciated (consider bacon). 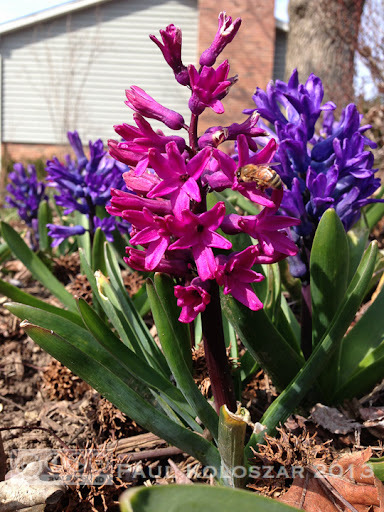 Hyacinth gives us olfactory and visual stimulation, though. I could weed and cut back stuff and, and,... maybe lounge in the hammock all day by the hyacinths. Mmm, hammock. Doze off a couple yards downwind (some find the fragrance overwhelming when close by). Take a little nap. 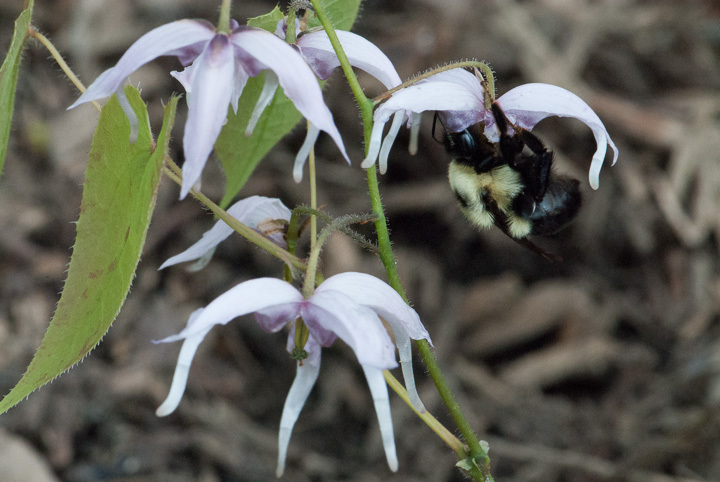 Awaken to the gentle hum of honeybees making their way from one bloom to the next. 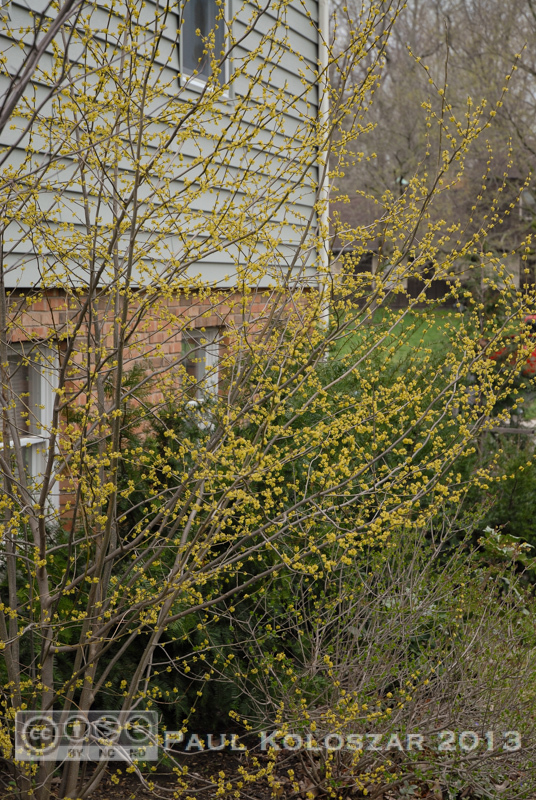 Growing Lindera benzoin (spicebush), one of the earliest shrubs (beaten out, here, by witchhazels) to bloom every year, that's what! Okay, perhaps that is a little over the top. I get that not everyone is into bacon; it's not for everyone (my apologies/condolences to those who aren't permitted). I suppose it's equally possible that one might not be interested in growing a shade-tolerant shrub with fragrant flowers under a window that catches breezes. Heck, some of you might not even look forward to opening your windows to bring in that first breath of warm, fresh spring air (personally, the wait is killing me). 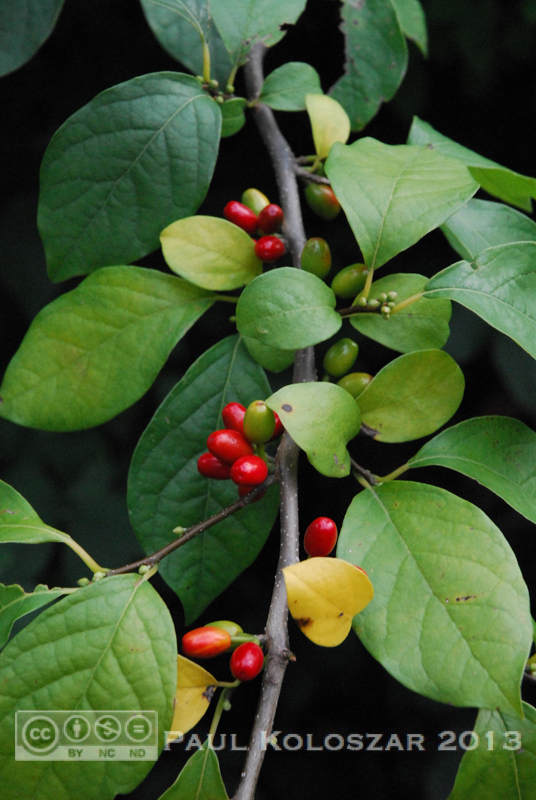 Perish the thought of experiencing the frisson that might accompany inhaling the delicate perfume of those numerous little yellow flowers found in clusters up and down the slender, yet sometimes lengthy (see above), stems of the spicebush. Individually insignificant, the tiny flowers are borne in overwhelming numbers. Certainly whelming numbers, at least. 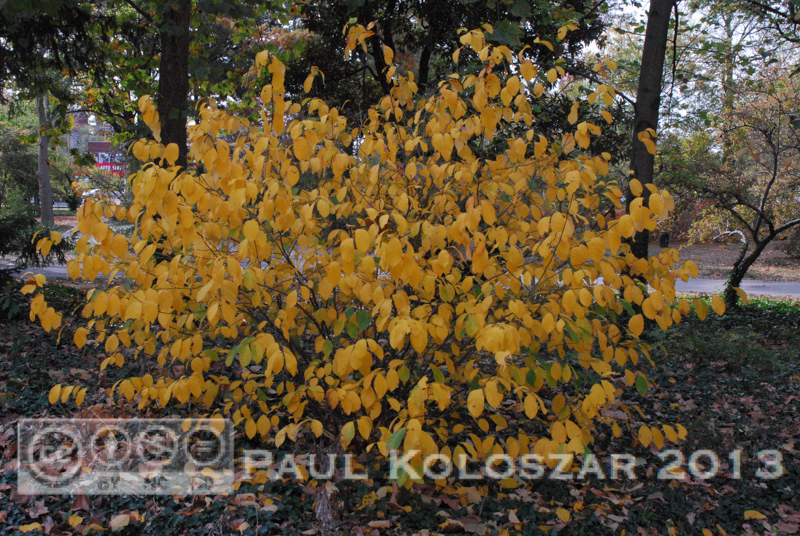 I know, too, that a shrub which merely grows medium green, unvariegated, yet-tasty-to-the-larvae-of-the-beautiful-spicebush-swallowtail foliage which turns yellow in fall may be equally unappealing. Even though mid-October (2009) this is pretty representative of average summer foliage, hints of fall color notwithstanding. 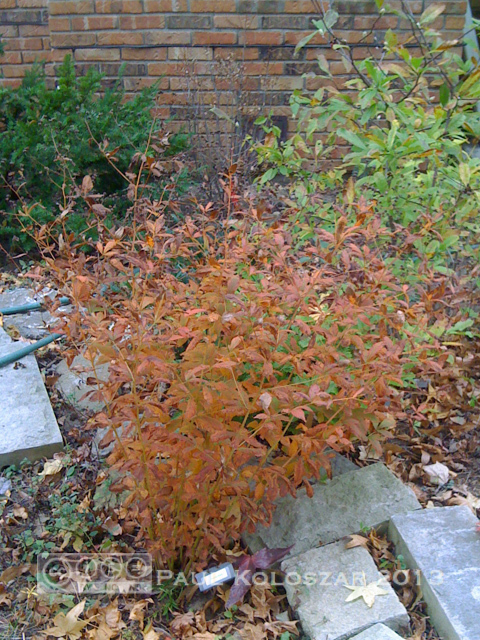 One year and six days later, full bore fall color. 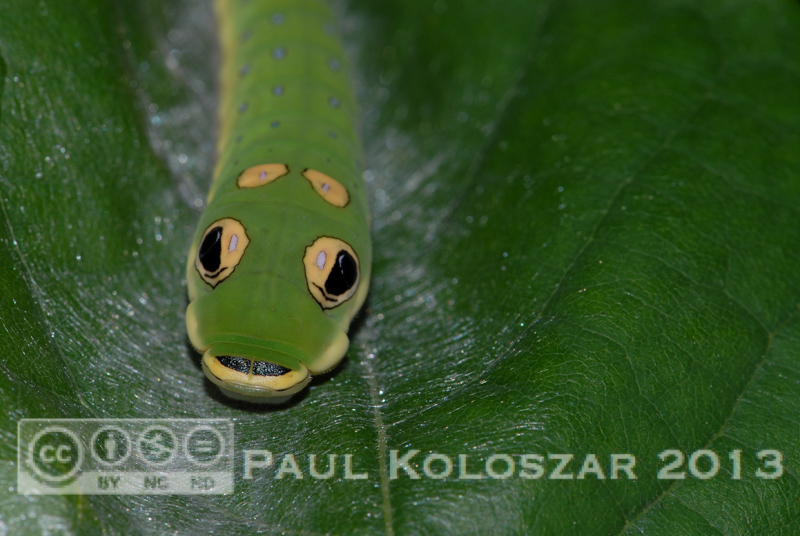 a spicebush swallowtail larva. Don't be fooled by the eyes; this is the posterior end. And those little red berries it produces, reportedly eaten by songbirds, are certainly responsible for a scattering of seedlings around any but the cultivar 'Rubra' (I've never laid eyes on one yet) and probably represent a threat to any nearby Amur honeysuckle colony! A pretty threat to Amur honeysuckle? You be the judge. Never mind, either, how well it's adapted for use in one of those trendy rain gardens (in the wild it's commonly found growing in bottomlands [which have nothing to do with your derriere- grow up!]). 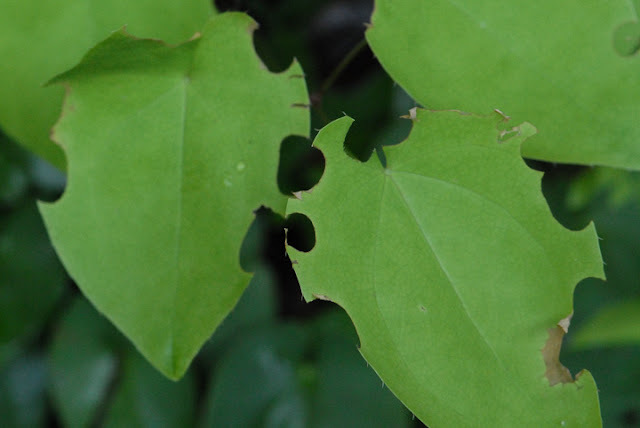 Although it hasn't happened to the spicebush in my garden (northeast corner of the house, the bed surrounded by perforated drain pipe connected to the downspout), have reported that deer may make a meal of the slender branches. So, deer like it. I bet they don't like bacon, though. 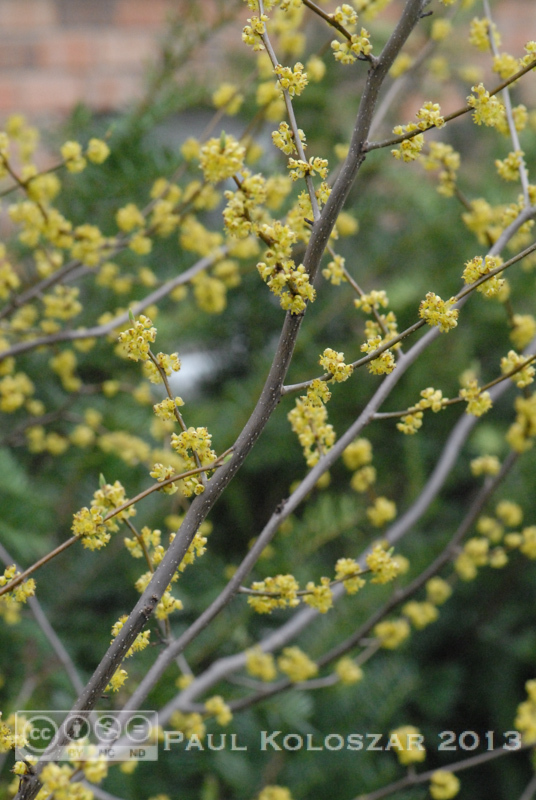 However, I still understand that, like the many witchhazels (locally, they win the first-shrub-to-bloom contest), spicebush isn't for everyone. Perhaps not even for some of you who DO like bacon. To cut back, or to wait? Spring IS upon us. As many have undoubtedly noticed, it's quite unlike that of 2012. Dire longterm portents aside, I'd rather have a speedier warmup. 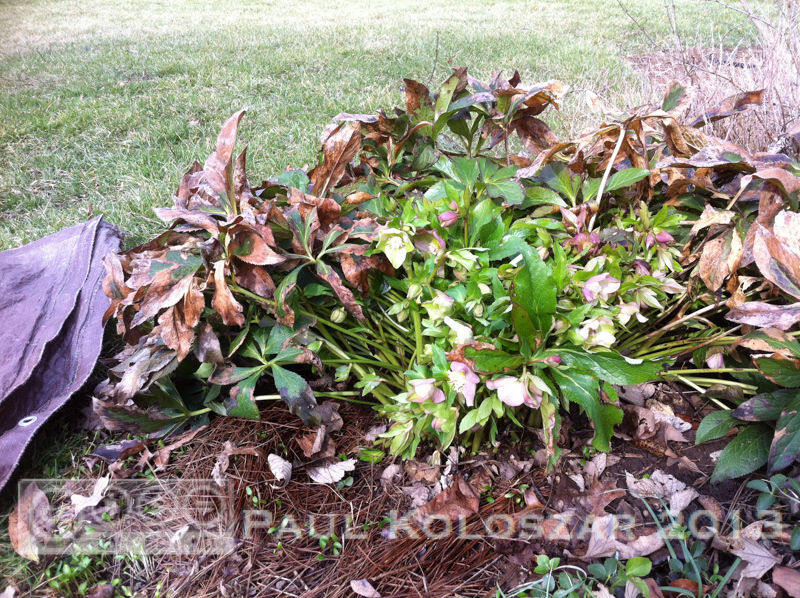 Last Saturday, in those hours when the weather was pleasant, I found the time to cut back the old foliage on the hellebores. By the look of the largest clump (others in the garden have been moved once or twice, which is something one should avoid doing with hellebores), I was a bit on the late side. 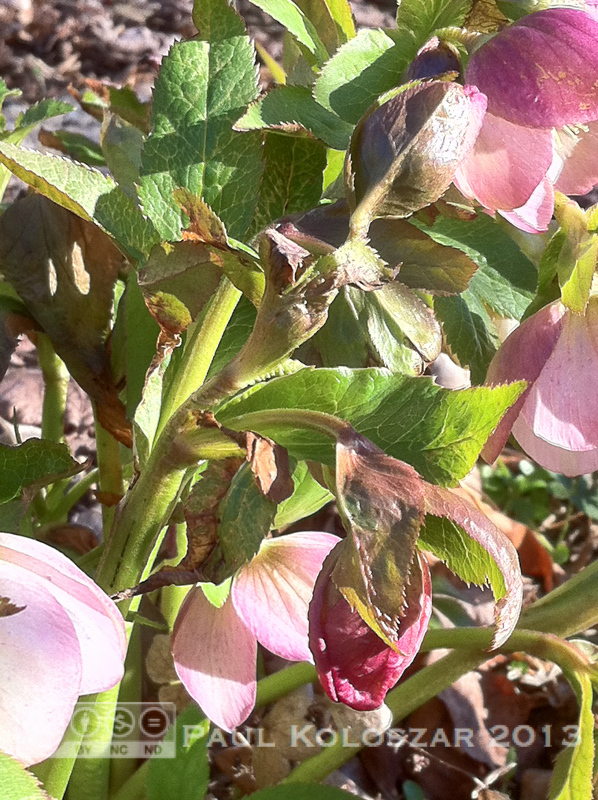 Hellebore, partially divested of last year's leaves. A lot of new growth was six to eight inches tall and had not only buds but open flowers. Taking care to avoid accidentally cutting new stems makes cutting back slow work. But, I think the dense older foliage can provide some needed protection for the new growth from late cold snaps and snow. 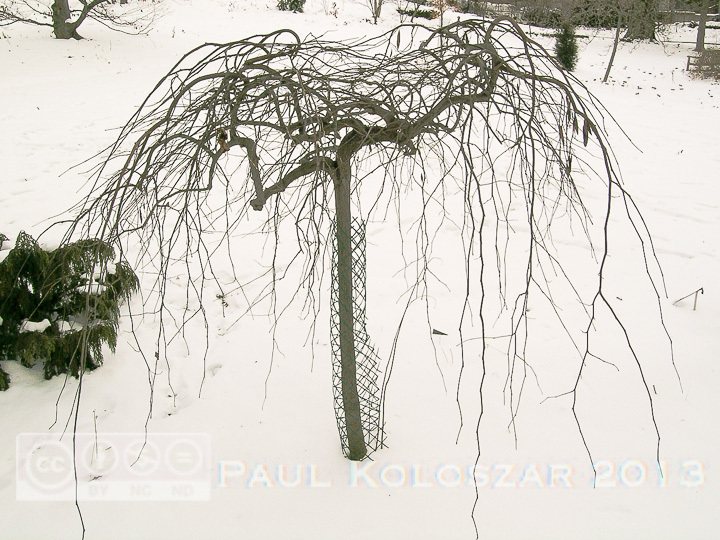 I have some scant evidence in support of this: new shoots of other clumps, their old foliage being less dense, had suffered some light, but still apparent, cold damage. It could be, too, that they're in a less sheltered location. Some browning on this year's growth. Either way, in spite of my annual fretting over whether I've waited too long before cutting, or that I've cut them back too early, they haven't failed to put on a decent spring show. 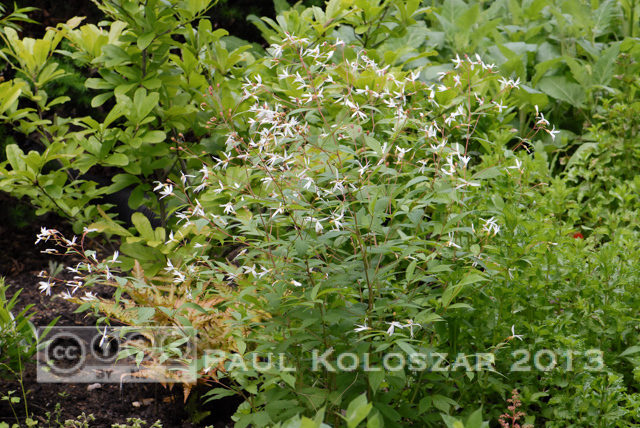 Now is also a good time to cut back old Epimedium (images of several can be seen here) foliage. That is, it's certainly much, much easier to avoid inadvertently cutting off new growth right now. Now, I just hope it doesn't get too cold over the next few days. Sometimes we may learn more from a man's errors than from his virtues. Sometimes my brain fails to deliver the right information about the thing I see. Please allow me to explain, to your benefit. Yesterday found me outside (that's happening a lot lately, and should continue; warmer please!? 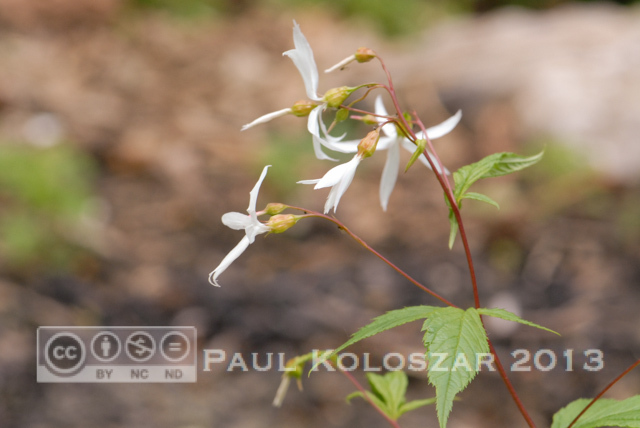 ), poking around in the woods at East Fork State park. I should be looking up. However, knowing that spring ephemerals are starting to show up (Hello, harbinger of spring! ), I can't help but look down. So, I'm pretty excited because I think I've spotted some putty-root (Adam and Eve is another common name; the latin name is Aplectrum hyemale) in a location that isn't as remote to me as, say, the Smoky Mountains. Aplectrum hyemale, or putty root. As I said, I was excited and I couldn't help but share my discovery with others around me (what point is there in knowing something cool without being able to share that knowledge?). A native orchid! 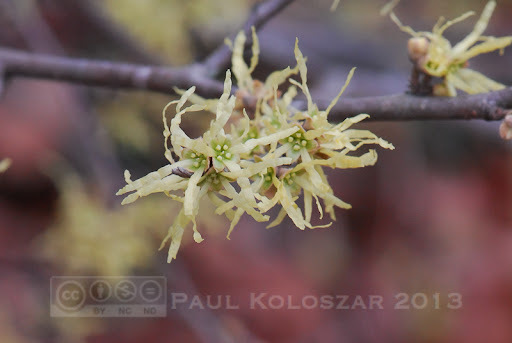 The leaves emerge in fall, persist through winter, and senesce (die back) just as the flower emerges. 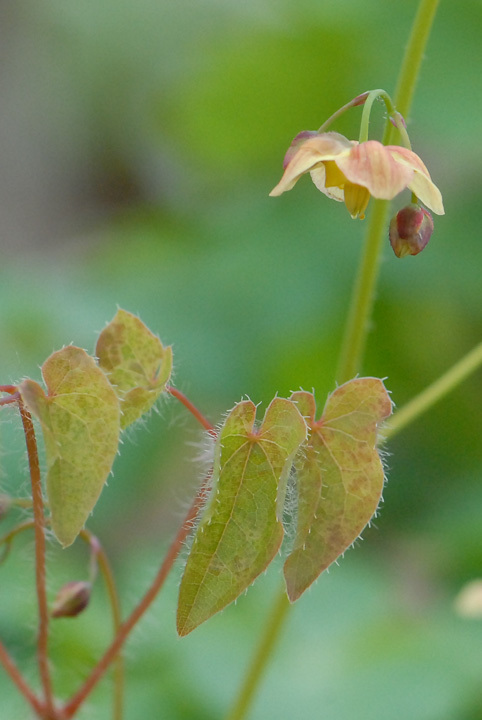 I have yet to capture an image of the blooms, but one can see images of those at the PLANTS database profile for putty root. And then, last night, as I lay in bed, I realized that it wasn't putty-root that I found. I had soundly misremembered the name of what I had actually seen. The foliage I saw belongs to the crane-fly orchid (or cranefly orchid; Why crippled? I have no idea, but am willing to entertain any theories). Tipularia discolor, or crane-fly orchid. NOT putty root. Not green-and-white striped. Spotted. 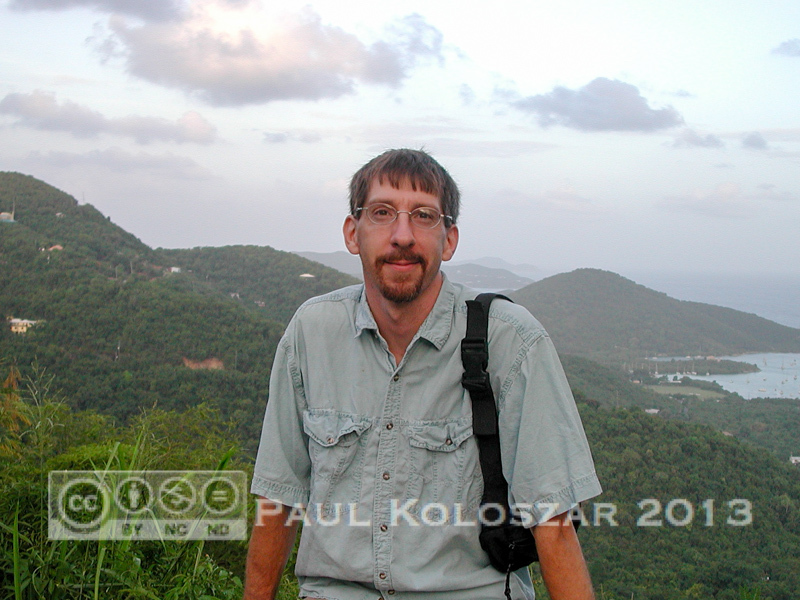 The spotting varies between individual specimens, and can be quite attractive. 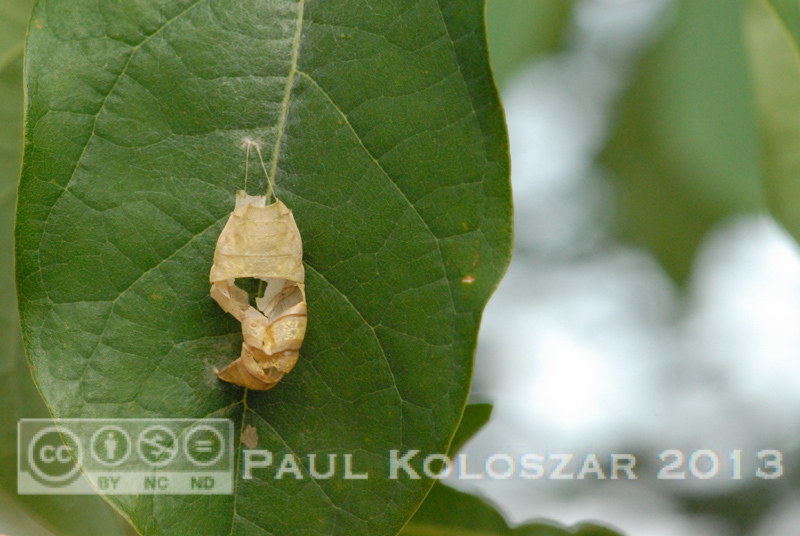 The underside, if one were to turn the leaf over, is purple (I've seen newly emerged leaves look purple on both sides). Again, I have yet to capture an image of this flowering, so I will refer the reader to the PLANTS database profile for cranefly orchid. 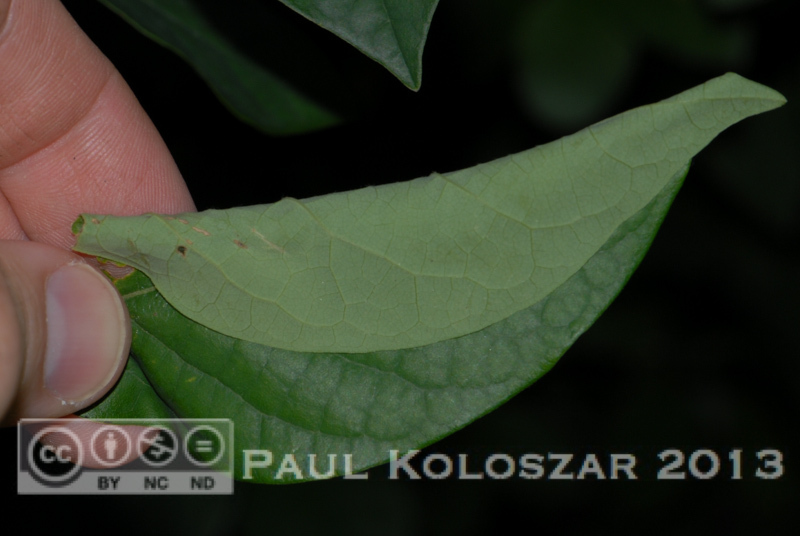 So, while they have a similar lifecycle, and while they take on a roughly similar form, it's relatively easy to distinguish the two when in leaf. The hard part is getting my brain to maintain the proper associations, and deliver the right name sometime sooner than eight hours after seeing the plant! 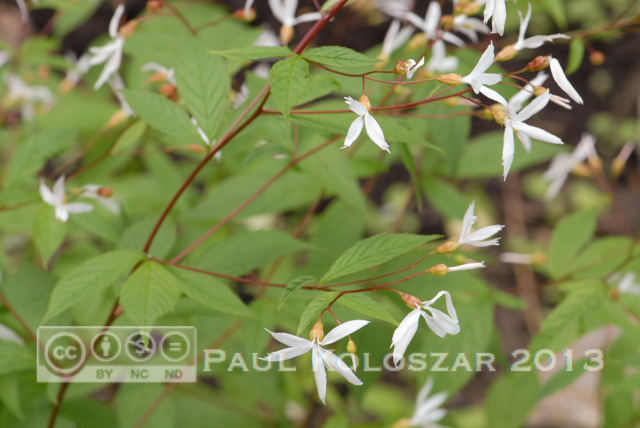 One might almost mistake a well-established Porteranthus trifoliatus (also known as Gillenia trifoliata), or Bowman's root, for a dainty shrub. 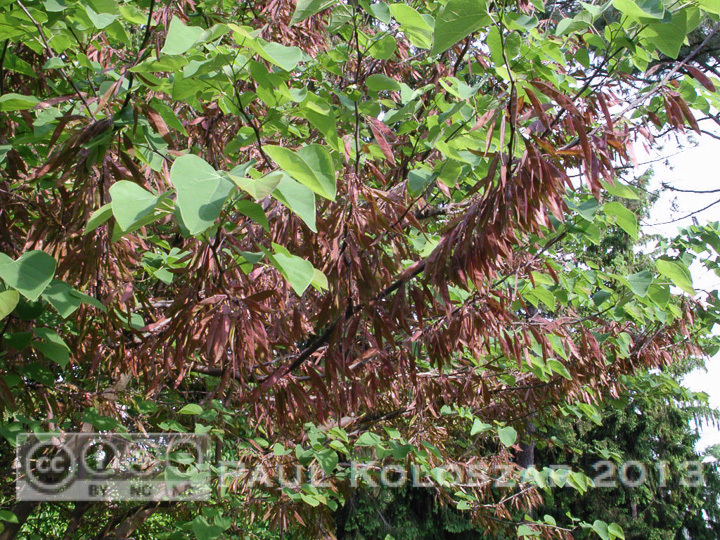 In the part shade cast by a sweet-gum (which is much hated by my wife) to the south side of our house, this perennial throws up around a dozen wiry reddish stems that top out, with flowers, at around two feet. This specimen sits near the end of a run of perforated drain pipe, which while I wouldn't classify the area as being generally moist, it's better off than many other areas in the yard. In any case, the plant is doing well enough that I have found seedlings of it in the general area. 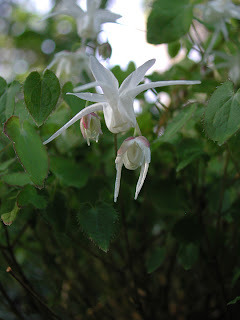 A flush of five-petalled white flowers appears some time between mid-May and early June. 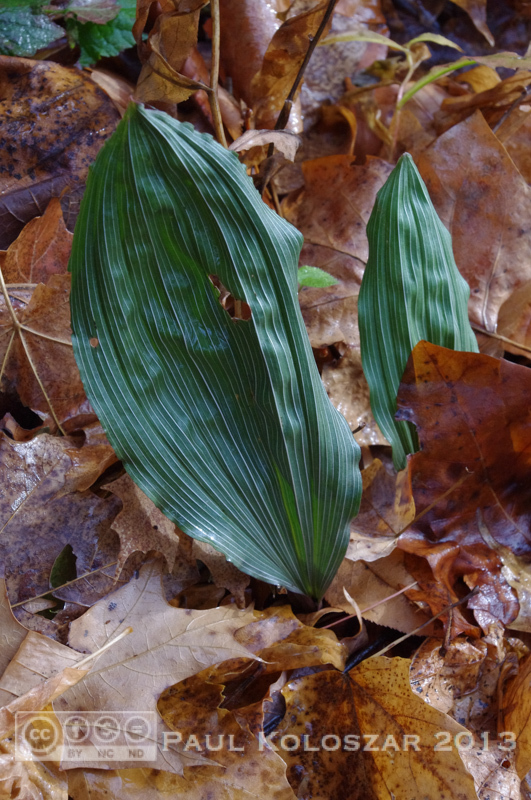 As the specific epithet trifoliatus suggests, the leaves are in threes (three leaflets, really). 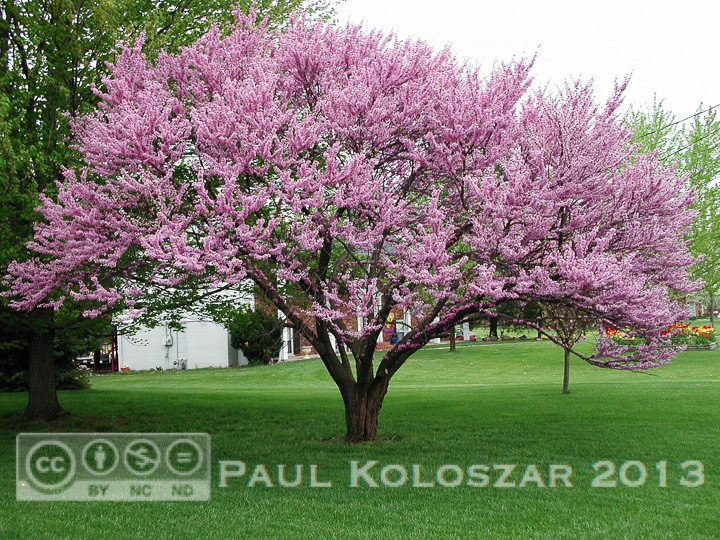 More blooms may appear sporadically over the remaining growing season. Orange pushing toward red, 2010. I know it's going to get warmer here. Soon, though possibly not soon enough. For a chilly and dreary day, here are some reminders that we were once warm and will be warm again. Here's Calotropis procera, or roostertree, as I found it when visiting (back in 2005) the island of St. John. 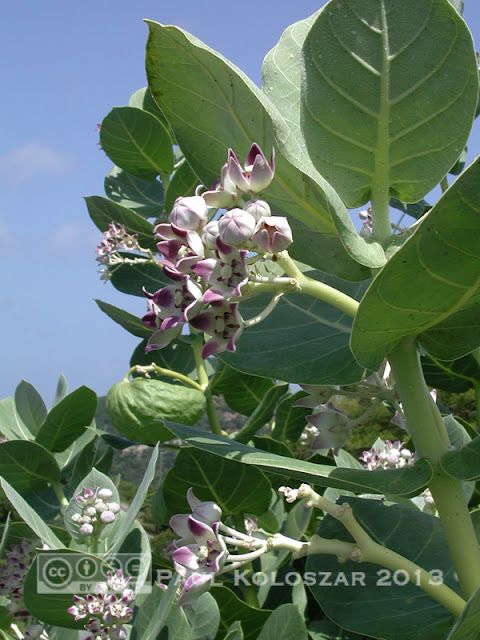 As a member of the milkweed family (Asclepiadaceae), it reminds me of the many Asclepias species (which are in the same family) one will see along roadsides and in fields across much of North America in the summer time. 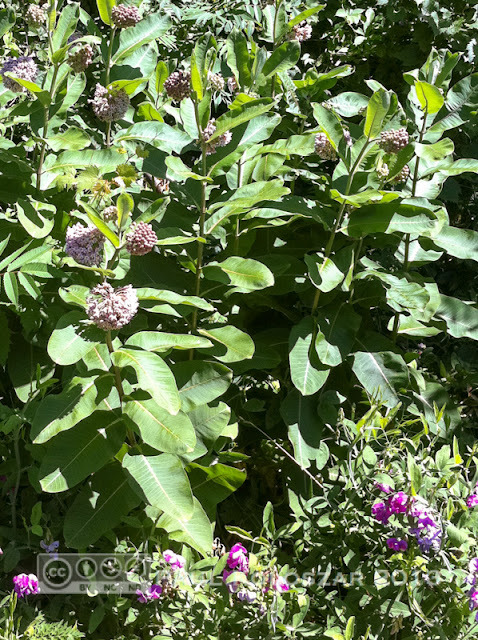 Asclepias syriaca, or common milkweed, with sweet pea. 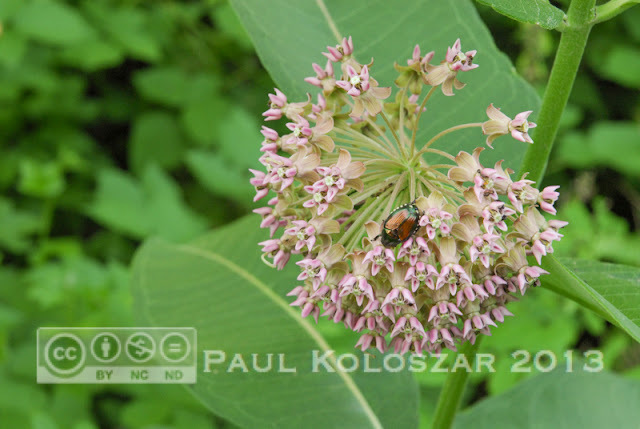 Asclepias syriaca with Japanese beetle. 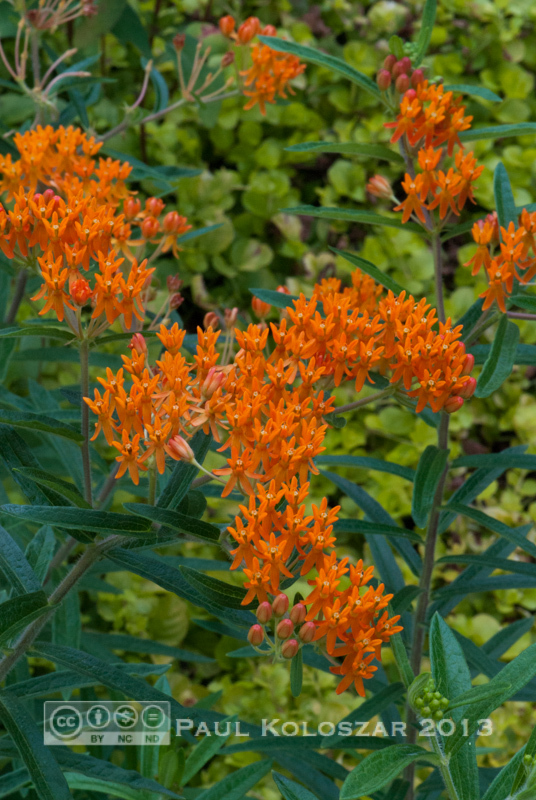 Asclepias tuberosa, with Lysimachia nummularia (moneywort) 'Aurea' running around underneath. 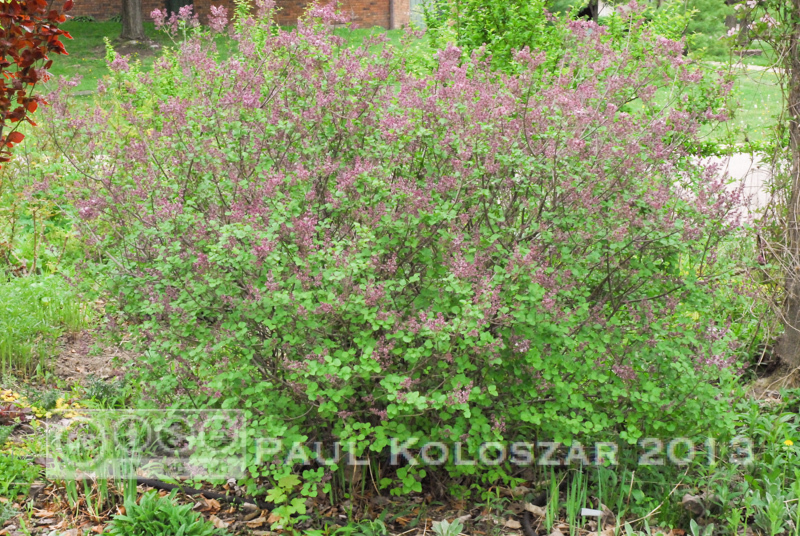 Given the fact that Syringa meyeri 'Palibin', or dwarf Korean lilac, has been in the trade since the 1920's, one might expect to see more of it in the landscape. After all, it really has quite a lot going for it. 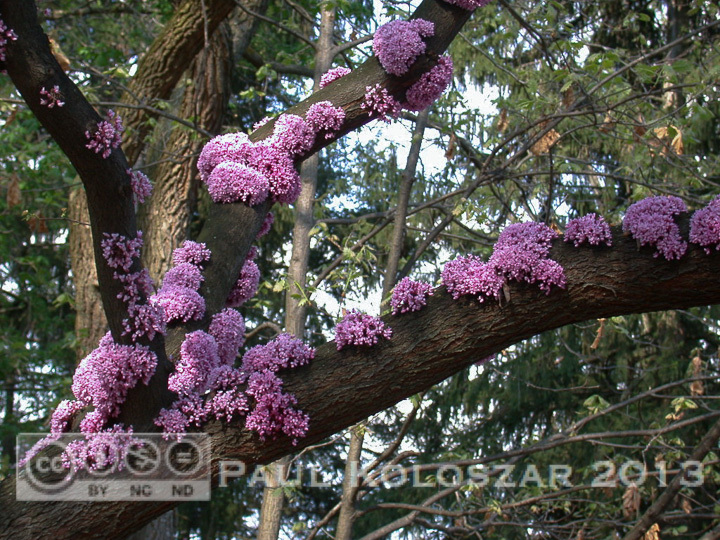 'Palibin' blooming in early May of 2006. 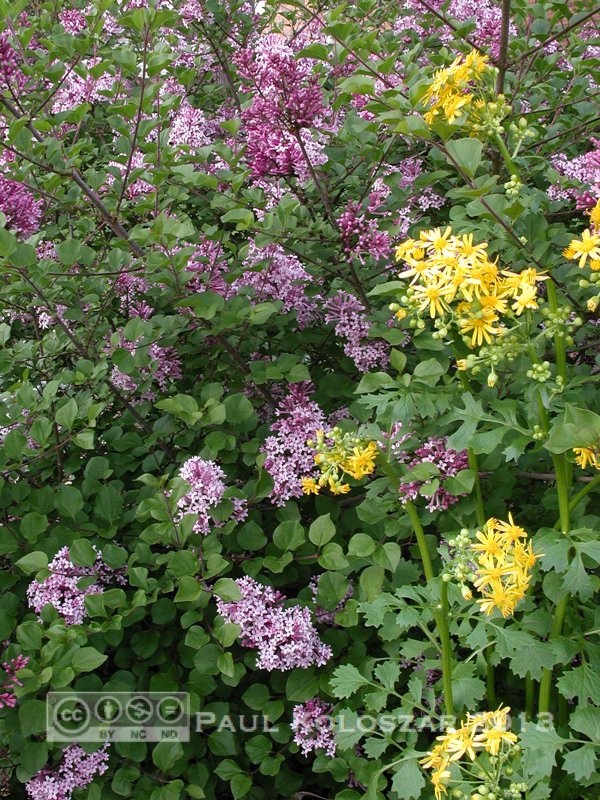 The more familiar common lilac, S. vulgaris, easily reaches heights of eight or nine feet and typically forms a clump just as wide via suckers. 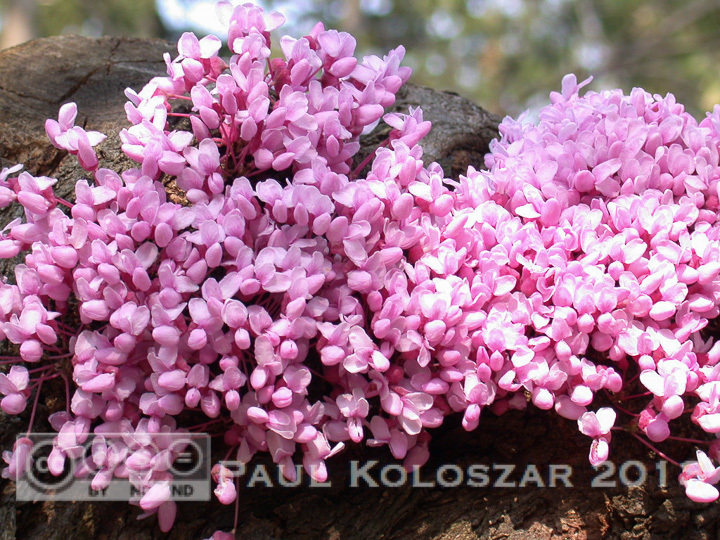 S. meyeri is, as the common name suggests, more diminutive in nearly every aspect. 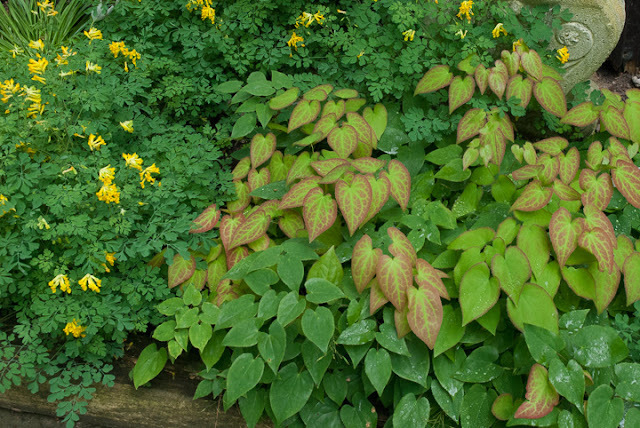 It typically tops out around four or five feet in height and spread, possibly making it more appealing for the smaller garden/yard. 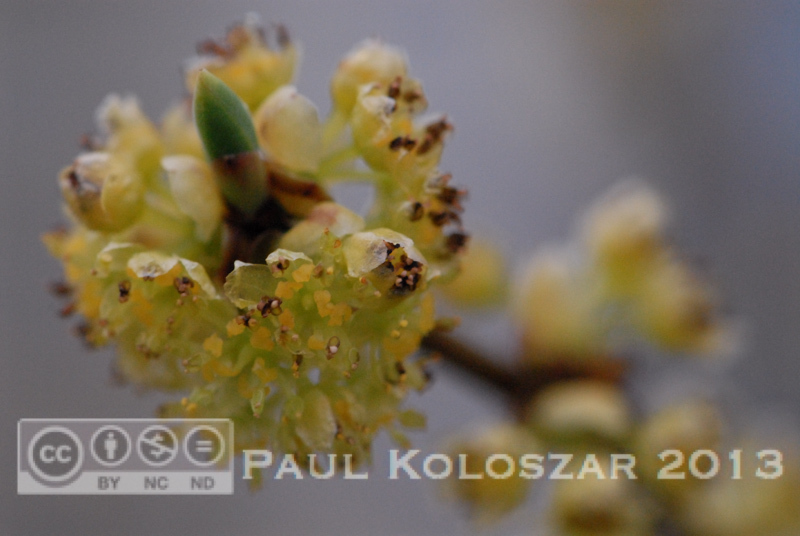 For what it's worth, 'Palibin' blooms slightly later; usually only beginning to bloom when common lilac is peaking bloom. The same specimen as above, late April of 2010. Still less than 5' tall, but spread out a bit. 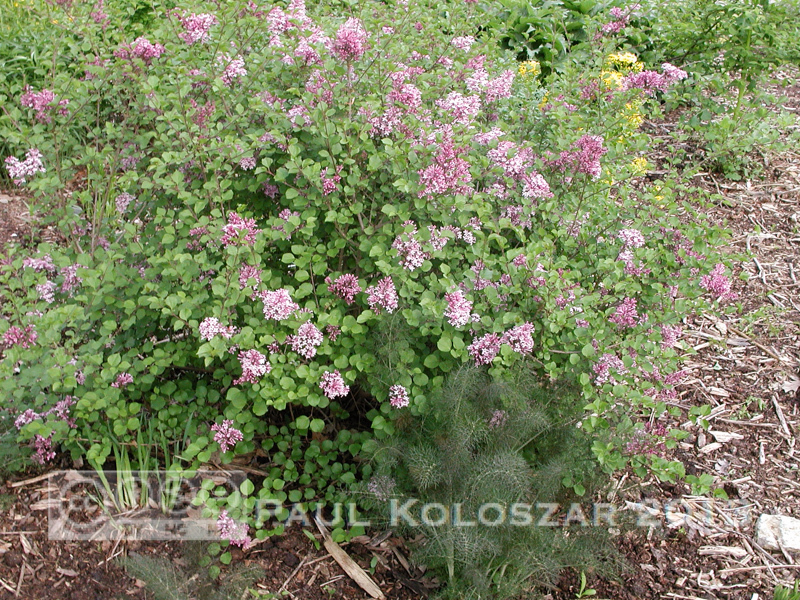 Discounting size, 'Palibin' still has a number of advantages over common lilac, most notably that it is resistant to powdery mildew. While the leaves of many common lilacs gray over and possibly drop off, the medium-green leaves of 'Palabin' stay clean through the humidity and heat of summer. I've grown 'Palibin' on both the east and north sides of my house (sometimes I test limits) and never saw any mildew. 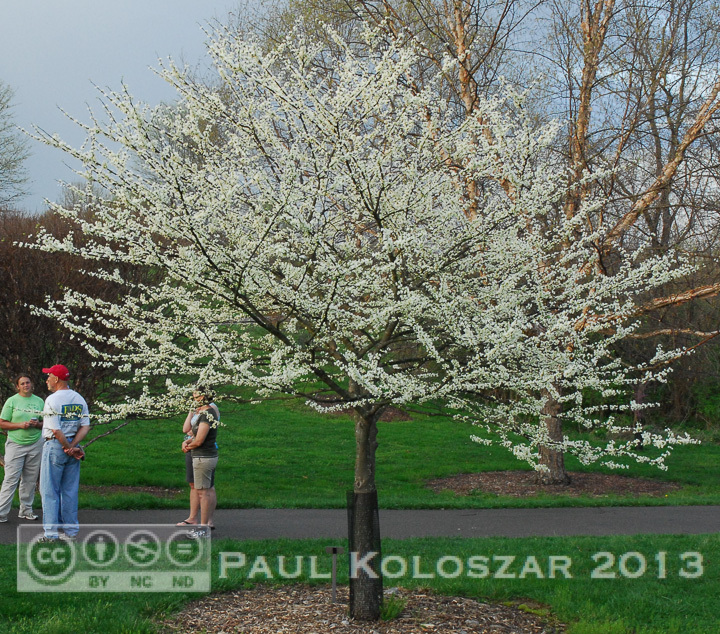 However, it also produced fewer blooms in those locations. A sunny location would really be optimal as far as limiting potential mildew problems and getting the most blooms. 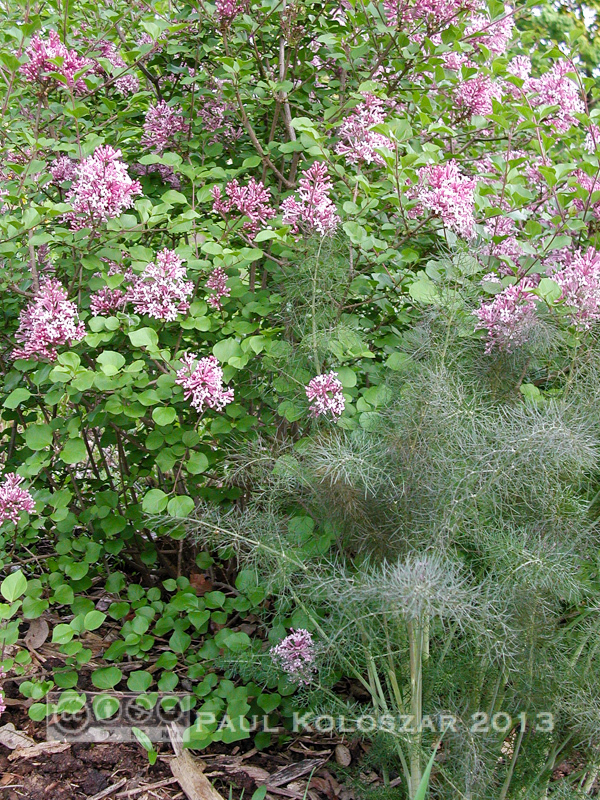 The flowers of 'Palabin', as with most lilacs, are delightfully fragrant. But that fragrance differs from that of common lilac. Whether that's better or worse is a matter of judgement best left to the nose that will be inhaling the scent. 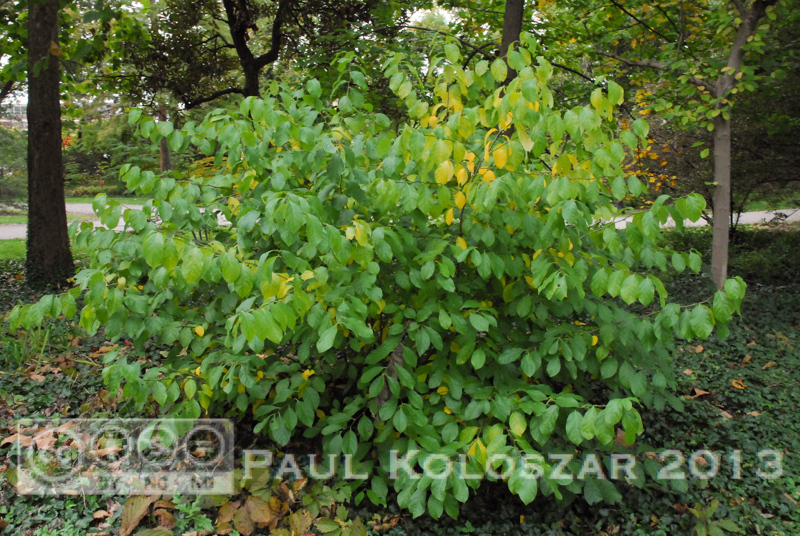 As a genus, Syringa doesn't usually have much to offer in the way of fall color, but foliage on 'Palibin' may change a bit in autumn. Being something of a plant pig, the word "showy" suggests to me that people who see a plant so described will immediately suffer a loss of interest in all other things going on around them. Potted specimens in garden centers will cause parents to ignore the child who is shoulder deep in yonder aquatic plants display. Neighbors driving past your garden will run into parked cars while craning to get a better look at it. The last properly marked division on the donated plants table at the charity sale may incite violence in otherwise intelligent, pleasant people. 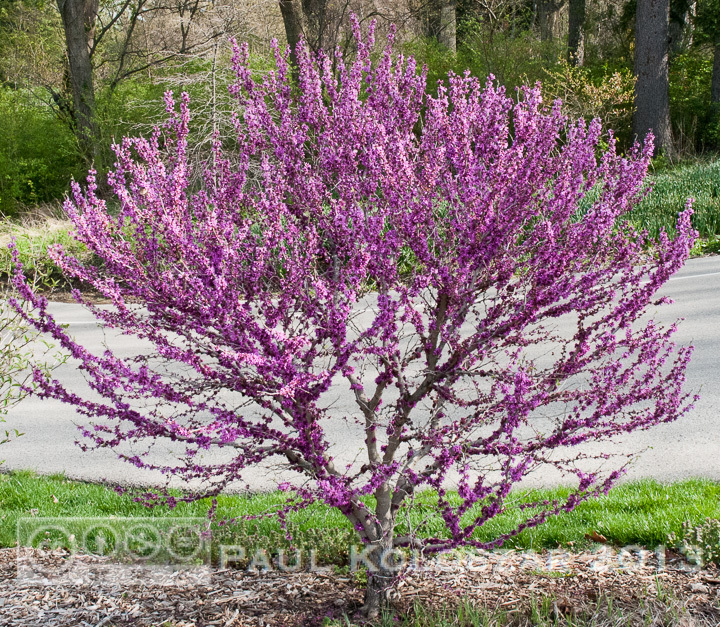 Scutellaria serrata isn't that kind of showy. While this perennial may, when it's blooming, be the showiest thing going in its natural habitat, it possesses a much subtler beauty in the garden. I've been growing it in a couple different exposures in my garden for over a decade. 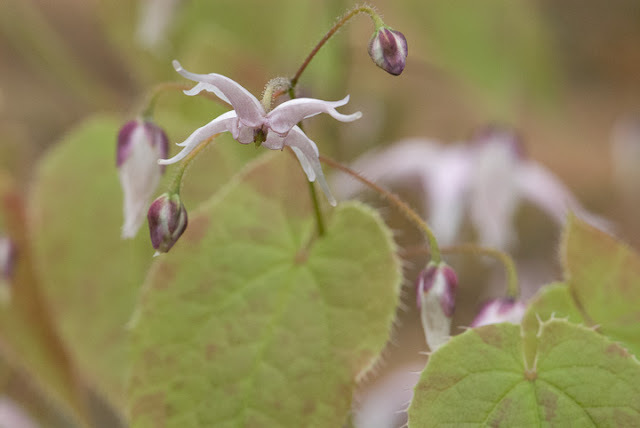 Over that time, the plants that have been in morning shade/afternoon sun have performed as follows: New foliage emerges a light, bright green, the margins delicately edged in purple. Growth tops out at close to a foot in height. It blooms, for me, in mid-to-late May. A single mature flower is approximately 1" tall. Mid-May blooms, 2007. Somehow I've not taken a picture of the whole plant when in bloom. Perhaps this upcoming May... 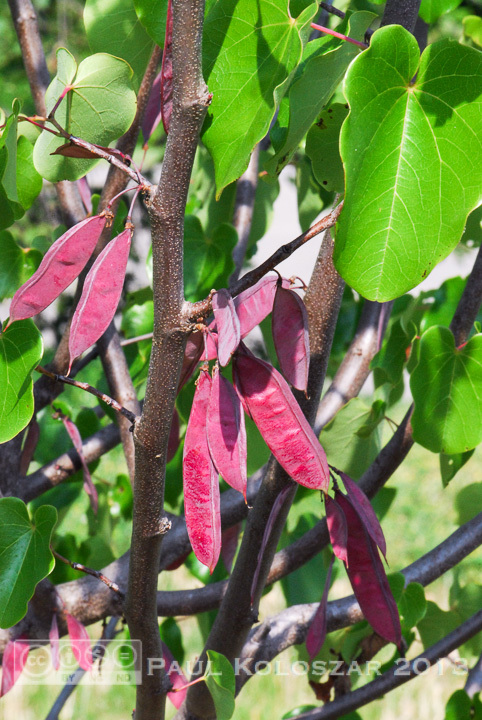 The seed pods that develop after that offer some interest, but are small and might be easily overlooked. 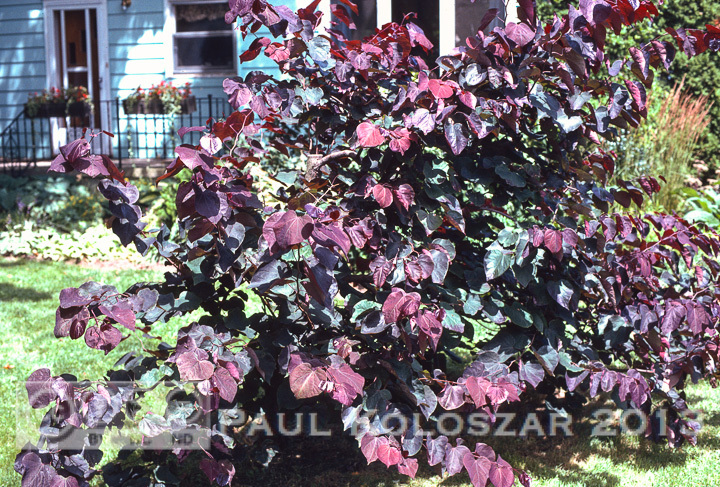 For me, the real post-bloom attraction is the development of color in the foliage as summer progresses. 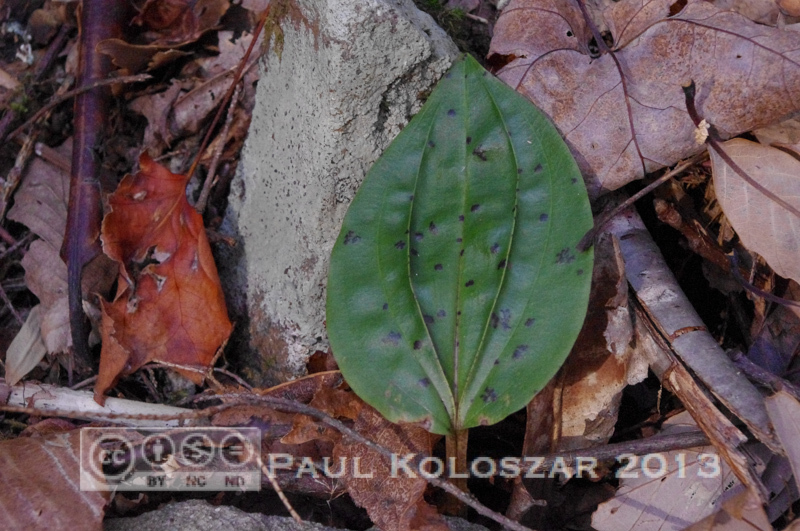 The bronzy purple tint at the leaf margins intensifies and spreads with age. I suspect the extent of that will vary with exposure to sunlight, so folks who grow this in more shade will probably get different results. 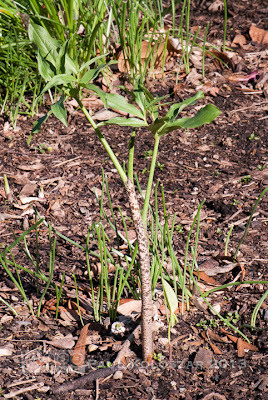 Over time, a single plant will slowly increase to a clump of about one foot across. I've divided such clumps maybe twice. 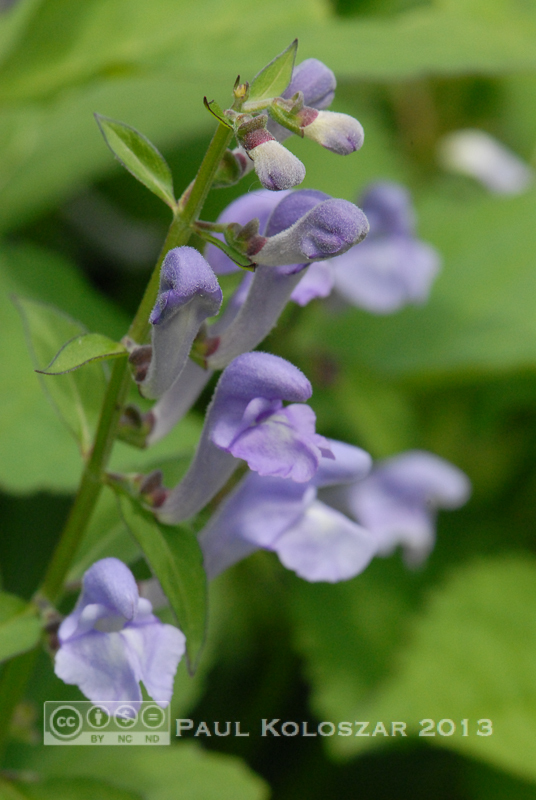 Pests that trouble other nearby plants seem to pass by this skullcap, and the droughts of late seem only to intensify the leaf bronzing. 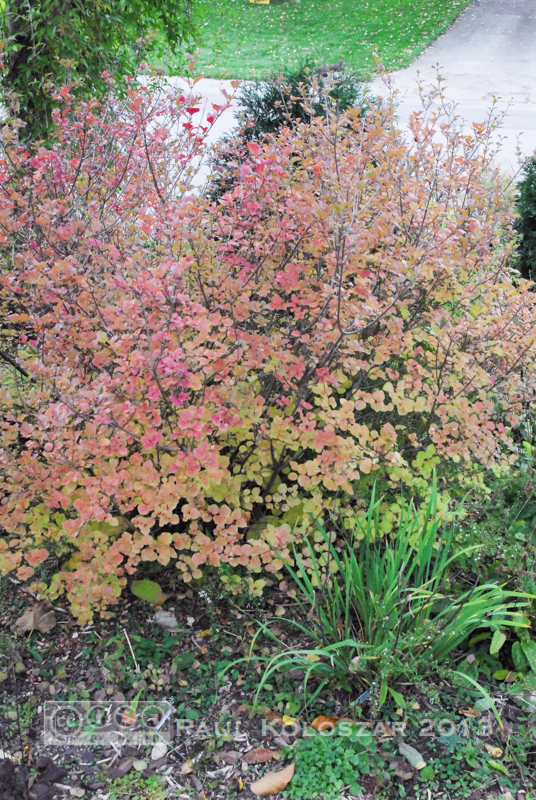 This is one of those plants that may not be conventionally showy, but which still deserves to be recommended due to their rock-solid reliability. I know that someone, someday, will be walking around the yard without me (supposing I move, get hit by a bus, etc.) and they will come upon something they want identified (here I beg the indulgence of my readers for what I accept to be a conceit of hopefully minor proportion; that my garden may hold a couple of plants which give a person pause to wonder…). That’s one, of a couple, reasons why I try to keep some record of plants I grow. You wouldn’t think that I’d have much trouble remembering what plants are in my own garden, especially since I like to label things. I admit that I make things difficult for myself by tending not to label a plant until it has lived through one winter. 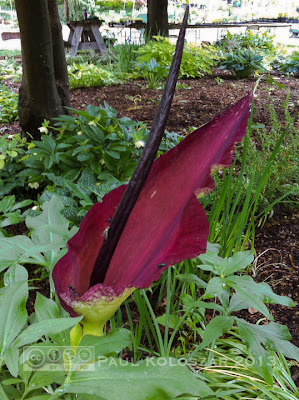 On the one hand, I avoid the unnecessary time spent making a label for things like the Dracunculus vulgaris (voodoo lily) that refused to arise from the $15 tuber (but I optimistically labeled a newly planted Sauromatum venosum, [also called voodoo lily] last fall- go figure). On the other hand, my pragmatic caution (sounds better than pessimism, what?) leaves me wondering where I even planted the Dracunculus. A young voodoo lily, relatively subtle in leaf only. I've lately been trying to update a spreadsheet that amounts to a personal accessions list for my garden (for the unfamiliar, that's essentially an inventory of plants that one is growing or has grown). Keeping such a list isn’t just my way of indulging an obsessive-compulsive urge, it’s a way to track successes and failures so I can make informed purchases, site plants for optimum growth and ornamental effect, and finally so I can relate sound information about those plants to others. With that in mind, this (nod to mild obsessive-compulsive tendencies) spreadsheet includes a column with the title "labeled." 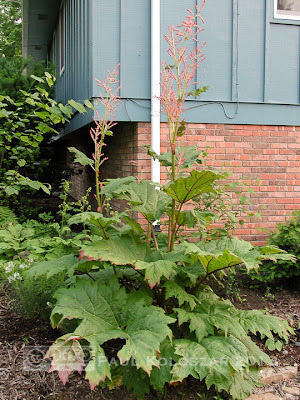 Ideally, every record would include a “y” in this column, or at least the designation “n/a” (applied to plants no longer with us [Rheum palmatum var. 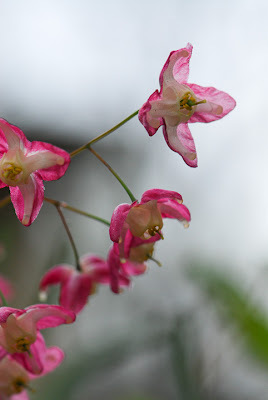 tanguticum ‘Rosa Auslese’, how I miss you!]). Unfortunately, the “labeled” column is littered with more occurrences of "? "and "n" than I care to have. Because, as I’ve already alluded, sometimes I forget what I've planted and where, I can't always put out a label and change the "n" or "?" to "y"(these little things can be so gratifying). What to do, but carry on and see what (or if) things pop where? 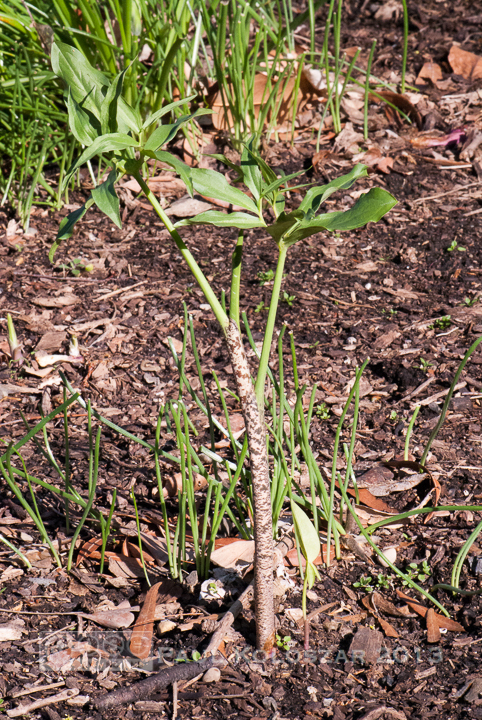 So, when I go to plant the next Dracunculus vulgaris (a gardener does not give up after killing only one of anything), I can’t be sure that I’m not plopping it into the same deadly (poor drainage? too exposed/cold? did the bloody squirrels find it?) spot as the last time. Then again, maybe I’ve just somehow missed the foliage of the tuber from 2011, so there’s a chance that when I dig a hole to plant a fresh tuber in what seems like a perfect spot, no labels indicating something hidden and biding its time, I’ll put the spade right through the old one. Of course, that's just silly. 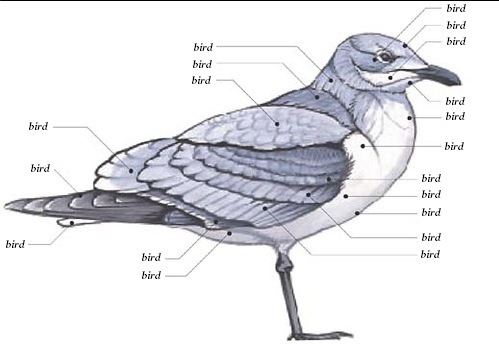 We name parts so it's easier to describe, because we want to differentiate one thing from another. Indeed, that's also why we apply proper names to the owners of the parts. Then there's that unwieldy list of attributes (fancy word for parts)... there's something to be said for being able to putting a simple handle onto a long list of the parts. Why, if we didn't do that, it'd be just a little, confusing, wouldn't it? Plant with bits cut out.